First off, I should say – we have pork available again! We’re selling halves and wholes that will be butchered March 20. We know some of you have freezers nearing empty, so please email or call if you’re interested. But it’s not just any pork – after two years of trying to make the logistics work out, this will be our first batch of pigs that we’ve been able to finish on whey rather than on more conventional feed with their pasture. 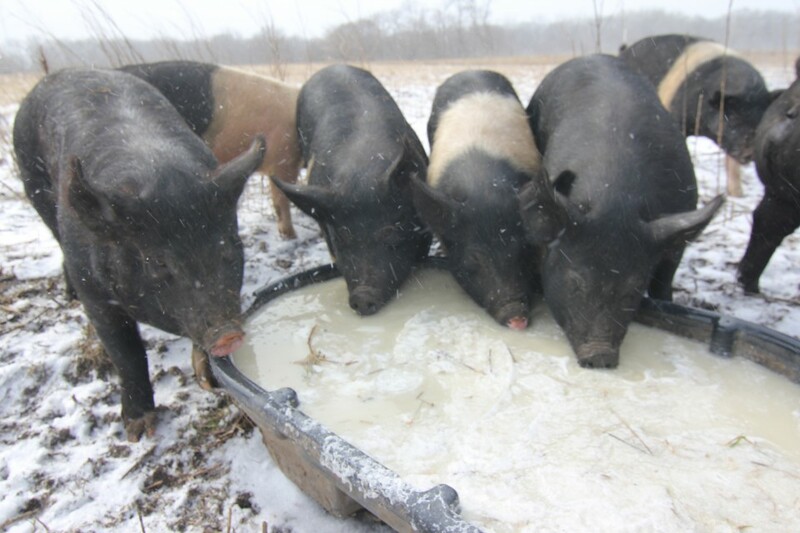 Whey is a traditionally prized pig food which together with pasture and hay for roughage can form a complete ration. I picked up a smaller batch earlier, but this Tuesday we were ready for our first big shipment – 1800 gallons or about 15,000# of whey from making colby and cheddar. 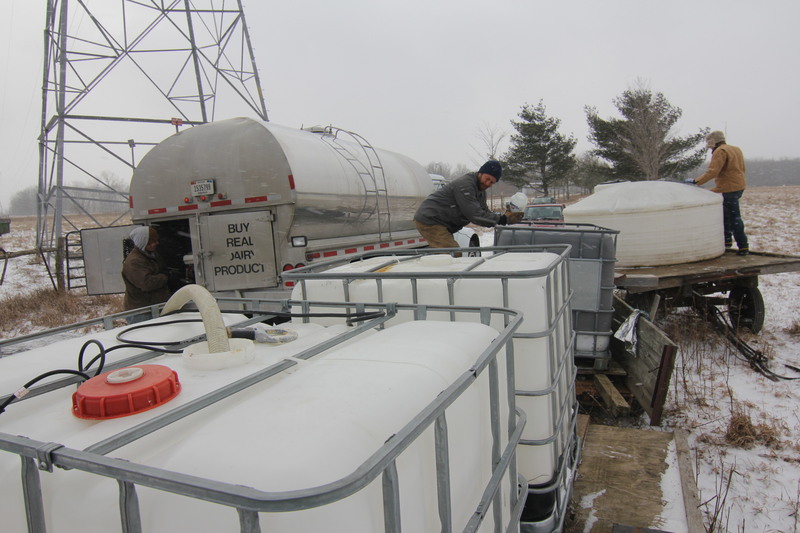 Tom got all of our tank capacity ready and on trailers or haywagons. The weather didn’t cooperate – it was about 16 degrees in driving snow. Bad for us, but good for keeping the whey palatable longer. 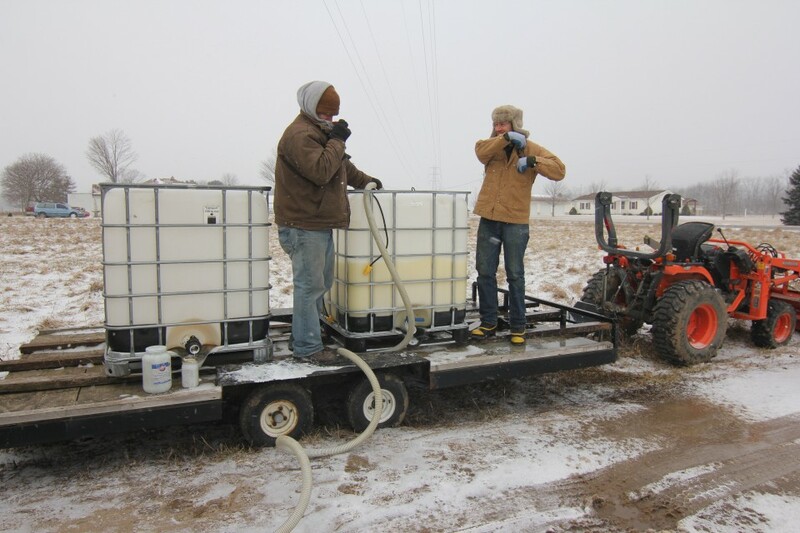 The truck has a pump and a 3″ line and fills the tanks really quickly. We’re working on getting bigger and more mobile tanks for the summer when the pigs will be rotating more often, but for now, we can just gravity feed whey into troughs, which seems to work just fine. 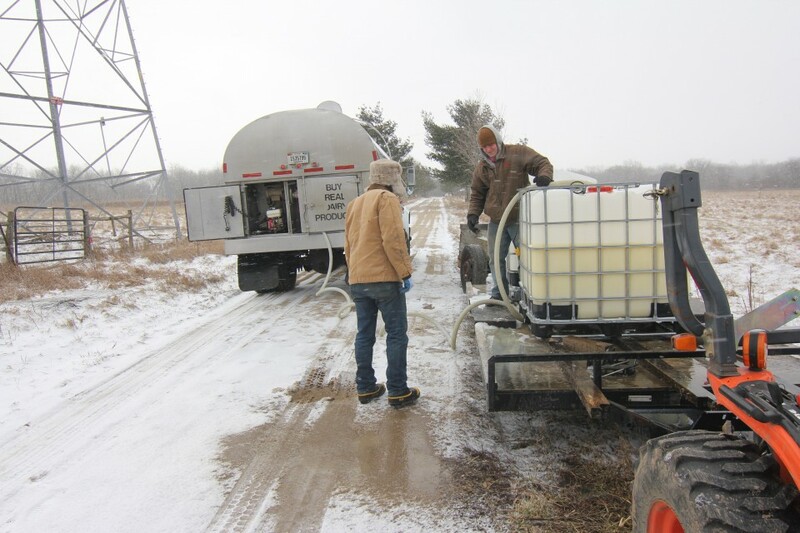 Here we’re just getting every bit we can by filling troughs straight from the truck – usually we’ll feed from our tanks. All in all, we’re really excited about this. It’s an all-around win – better pork by using a byproduct. The only problem so far is the constant puns, like the title of this blog post.